Connect to orders data to analyze the production, shipping and profitability of every organization's processes. Calculate and analyze your data with easiness of views and actions. Share and monitor your entire organization. Automatic data updates to keep your data analysis in real-time. Analyze your production process and increase efficiency with manufacturing charts Manufacturers today are faced with many sources of data: workforce and order planning from the ERP system, order information from MES systems, time and attendance logs, alarm and production data from different equipment manufacturers, various PLC and SCADA systems. How do you link these islands in an archipelago of related data? Tableau enables you to quickly blend and link similar data to gain deep insights that would have otherwise taken too long to bother. By giving you the ability to analyze live data and historical data without programming, you can answer questions 10 to 100 times faster than ever before. 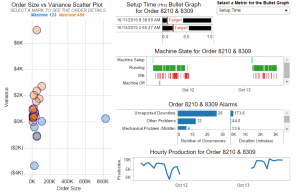 This dashboard lets you explore the performance of a few dozen orders filled by a manufacturer using its two machines. Browse through the orders that were filled on the left and see how well the production run actually ran by bringing together several data sets on a single dashboard. The Bullet Graph depicts the major metrics that affect production (setup, downtime, run speed). Note how the differences in variance trend between the two machines. Why is Machine 123 running better than Machine 456? Click on a few orders to find out. Monitor all relevant production data from a single dashboard Quality data is critically important but notoriously hard to compile. It often includes data from customers, machines and plants. Unlike other manufacturing BI tools that require database knowledge or IT experience, in Tableau you simply drag and drop to blend data in the same view. You can also combine multiple views on a dashboard to get the whole story on quality. 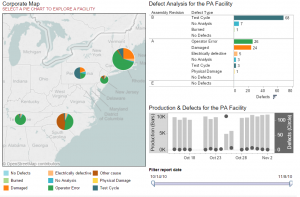 This manufacturing dashboard lets you choose a facility by clicking on the map. Then you can see detailed defect information for that facility in the top right view. In the lower right view you can see production (bars) and defects (circles) at that facility over time. Notice how high defect counts generally lead to lower production levels in the days immediately following the defect.